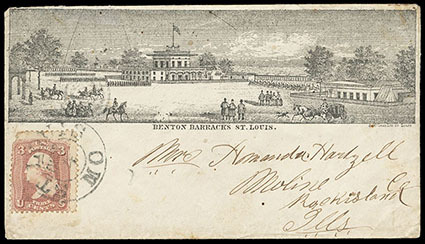 Benton Barracks, St. Louis, patriotic view design on cover to Moline, Ill., franked with 1865, 3¢ rose (small corner nick) tied by "St. Louis, Mo., Oct 4" cds; partial backflap, otherwise Very Fine, a very scarce military barracks design. 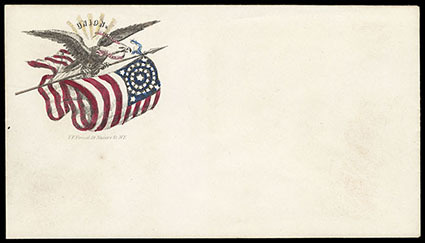 Kimmel Multicolored Civil War Patriotics, group of 10 different unused examples, spectacular hand colored designs in wonderful bright colors and featuring flags, eagles, female figure, Washington; couple with light overall toning, Very Fine, a nice group of these scarce patriotics. 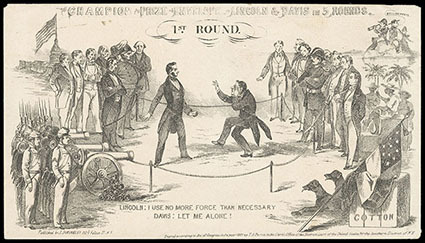 Lincoln and Davis in 5 Rounds, the complete set of unused patriotic covers depicting satirical caricature battle between North and South from 1st round to 5th, first round depicts Lincoln and Davis beginning to spar with several other designs, fifth round depicts a victorious Lincoln, printed in black by J.H. Tinley; 5th some creasing, F.-V.F. 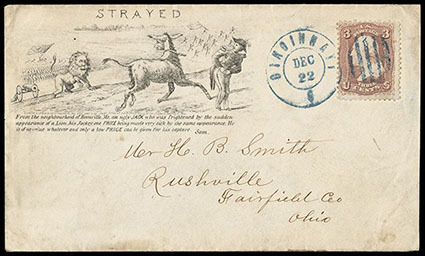 Lion, Mule, and Confederate General Price, patriotic design with three-line verse below caricature and "Strayed" slogan, on cover to Rushville, O., franked with 1861, 3¢ rose tied by blue "Cincinnati, O., Dec 22" cds and grid duplex, Very Fine; with 2016 P.F. certificate. 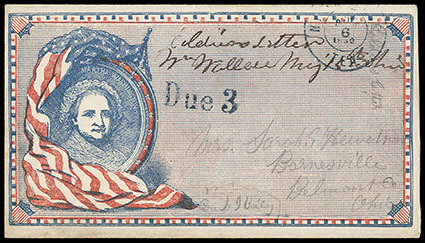 Martha Washington, red and blue allover design on cover to Barnesville, O., with blue "Nashville, Ten, Aug 6, 1862" cds and matching "Due 3" handstamp, manuscript "Soldier's Letter" endorsement at upper right, Very Fine. 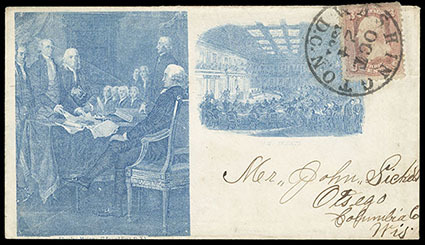 Signing of the Declaration of Independence and U.S. Senate, magnus two-panel blue patriotic design on cover bearing 3¢ rose (65), tied by "Washington D.C. Oct 24, 1861" cds to Otsego Wis.; stamp faulty from placement near top edge of cover, otherwise Very Fine and scarce Magnus patriotic cover, ex-Jarrett.